Mid North Coast startup founder Crystal McGregor encourages regional entrepreneurs to use the free Regional Landing Pad at the Sydney Startup Hub to unearth a world of possibilities. 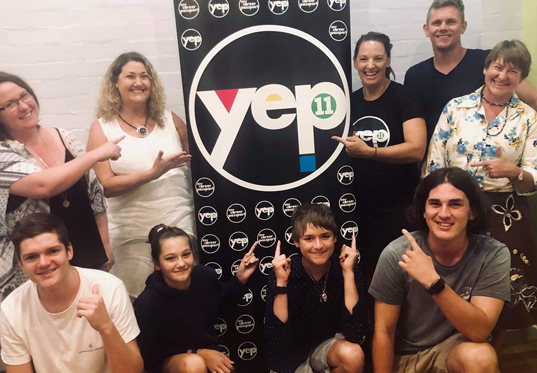 Ms McGregor, of Port Macquarie, is the founding director of YEP Careers which is rolling out a youth entrepreneur program across the North Coast. She has become a monthly visitor to the Regional Landing Pad and recommends other businesses do the same. The Sydney Startup Hub celebrates its first year anniversary this month and in the past year its Regional Landing Pad has hosted 1,072 meetings involving regional entrepreneurs, including over 132 from the North Coast. “We were first introduced to the Regional Landing Pad when we visited the Sydney Startup Hub to deliver pitch workshops for our youth entrepreneur program YEP11, along with our resource My Career Passport, and I fell in love with it,” Ms McGregor said. “YEP11 with My Career Passport is an 11 module incubator program to help young people aged 15 to 24 develop job skills with an entrepreneurial mindset. We are rolling out our program on the North Coast as part of the NSW Government’s Youth Employment Innovation Challenge. “We have now made visiting the Sydney Startup Hub a monthly priority as we realise that forming connections with other entrepreneurs and connecting our young people with them is invaluable for our business and program. Jobs for NSW CEO Nicole Cook said the Regional Landing Pad offers free startup space for regional entrepreneurs based outside Sydney, Wollongong and Newcastle. Regional entrepreneurs can visit for up to three days at a time to meet with other startups and potential business partners, investors, and service providers. “It offers 12 dedicated startup desks, a 12-seat conference room and meeting rooms with video conferencing facilities. Visitors also get access to events and networking sessions hosted by incubators like Fishburners, Stone & Chalk, Tank Stream Labs and The Studio,” Ms Cook said. Ms McGregor said the incidental meetings that she has had in the shared workspace at the Sydney Startup Hub were also one of the greatest benefits of visiting. “For example, I met a start company called Vennu that invited me to their business launch the following day which was a great experience. I was also introduced to Edwina Sharrock who founded startup company Birth Beat and who appeared on the Shark Tank show the following night. I also met the CEO of Jobs for NSW. “Great value and potential opportunities can come from meeting people and entrepreneurs at different stages of their business journeys, and you can share stories and experiences and learn from each other. “Our visits to the Regional Landing Pad have been excellent and it has been a great meeting place for us. We tell clients we are there all day and book time slots for meetings. Ms McGregor said North Coast businesses should make a plan now to visit the Regional Landing Pad to see what possibilities they can unearth.